When I left college I thought I was a pretty good cook. I had a repertoire of Mid-West inspired meals at my fingertips that I grew up with: Spaghetti, Chili Pie, Quiche Lorraine, Teriyaki Chicken and Rice (my homage to Asia: no veggies, just chicken breast chunks, Yoshida’s and Uncle Ben’s 5 minute rice). Add to that the frozen meals from Trader Joe’s that I could quickly heat on the stove or in the microwave and you have a pretty good idea of what I would eat in a given week. The first inkling I had that there was more to at-home cooking than bland, quick and easy-to-make meals was when I would eat with my post-college boyfriend (my now-husband) and his medical school roommates. They didn’t use recipes and certainly didn’t read instructions the rare times they used anything pre-made. Nic, AJ and Chris would throw things from the fridge directly into a big pan, and would then create some sort of sauce to go with it from whatever liquids they had on hand. They used herbs, REAL garlic (up to this point I thought garlic was a powder that you would buy in the spice aisle), and all manners of fresh vegetables. It was inspired chaos and it was delicious. I loved the by-product of these kitchen sessions, but their cooking methods really stressed me out. If I didn’t know how to cook a meal by heart, I would HAVE to have instructions and would HAVE to follow them step-by-step. It dawned on me that if I had skills, knowledge, and confidence in my cooking abilities I’d be able to cook more freely. So I began to take cooking classes. The beauty of cooking classes is that you learn a whole host of skills while enjoying delicious food and unique cocktails. It ends up being just a really fun, educational experience. I took my first classes in San Diego in Pacific Beach at Great News. I took observational classes, where the chef prepares the meal while teaching knife skills, cooking techniques, shortcuts, and easy variations to the recipes they shared. In San Francisco there are several cooking schools that are highly recommended. I took a page from Julia Child and took my first class in SOMA at Le Cordon Bleu. 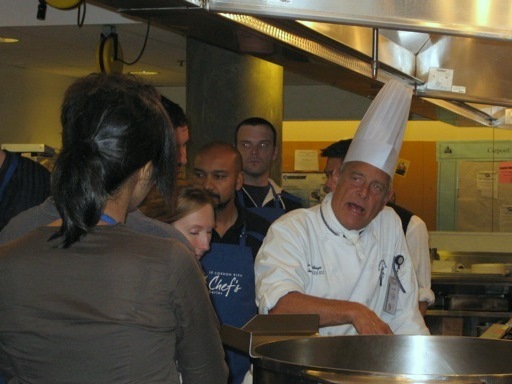 Le Cordon Bleu is a professional cooking school but they also offer classes for non-professionals. My husband and I took a “Home for the Holidays” class the weekend before Thanksgiving so that we were prepared to host our first Thanksgiving meal. This was the first hands-on class I have taken and I really enjoyed it. The Chef started us off by teaching the preparation of the main dish, Turkey Ballentine. Then we all went to stations and prepared the other side dishes for the meal. We were stuck chopping and peeling vegetables for the Ginger Apple Butternut Squash Bisque for a bit at our station, but as soon as we finished we were able to follow the chef around station by station and learned knife skills, cooking chemistry, and helpful tricks. At the end of the morning we all sat down and enjoyed the Thanksgiving feast we had each played a part in. We were also able to take home some of the incredible Turkey Giblet Gravy that the chef himself had whipped up out of a home-made turkey stock, roux, and a savory mixture of herbs. ~ by jessicamoriates on December 5, 2010.